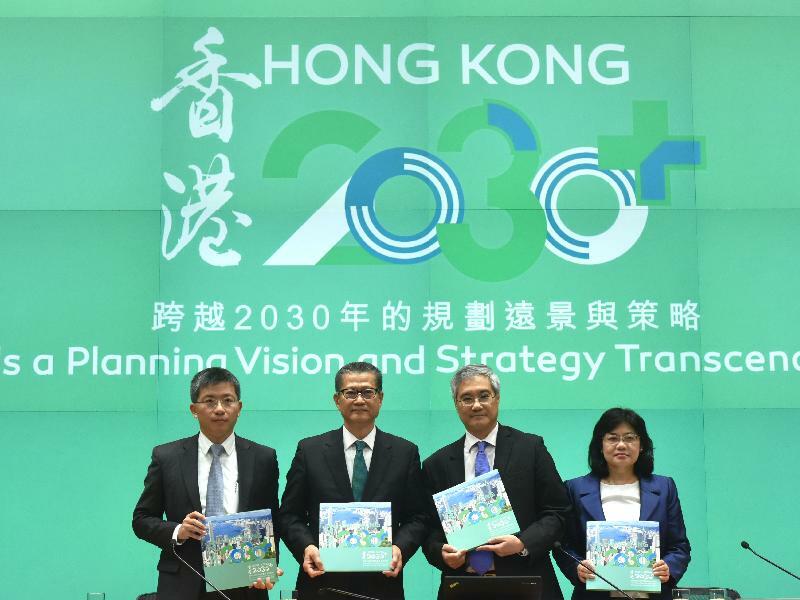 The public engagement exercise for "Hong Kong 2030+: Towards a Planning Vision and Strategy Transcending 2030" was launched today (October 27) to collect views from the public on the updated territorial development strategy for Hong Kong. The Secretary for Development, Mr Paul Chan, described "Hong Kong 2030+" as a vision-driven, pragmatic and action-oriented strategic plan to guide planning, land and infrastructure development and shape the built environment of Hong Kong beyond 2030. "Our vision is for Hong Kong to become a more liveable, competitive and sustainable Asia's world city," Mr Chan said. "We propose three building blocks to achieve this vision: enhancing liveability in our already high-density city, embracing economic challenges and opportunities, and creating capacity for sustainable growth." Mr Chan added that the strategic plan is the outcome of joint efforts of various government bureaux and departments in response to the challenges and opportunities facing Hong Kong. The Director of Planning, Mr Ling Kar-kan, said, "Towards this goal, we have proposed a conceptual spatial framework with a metropolitan business core, two strategic growth areas and three primary development axes, while preserving our natural assets and enhancing our liveability." The metropolitan business core encompasses the traditional central business district (CBD) around Victoria Harbour, the CBD2 in Kowloon East, and the CBD3 in the proposed East Lantau Metropolis. The two strategic growth areas are the East Lantau Metropolis and New Territories North, and the emerging development axes are the Western Economic Corridor, the Eastern Knowledge and Technology Corridor and the Northern Economic Belt. Mr Ling added that under the conceptual spatial framework, Hong Kong would be equipped with the necessary development capacity to enhance liveability, such as providing more public spaces and community facilities, and to achieve a more balanced spatial development pattern to bring jobs closer to home, in addition to meeting the current shortfalls of land and future land requirements to sustain social and economic growth. The public engagement will last for six months and activities will include public forums, topical discussions, briefings to stakeholders, guided visits, knowledge-sharing sessions and exhibitions. Details of the activities and engagement documents are available at www.hk2030plus.hk. Press conference on "Hong Kong 2030+: Towards a Planning Vision and Strategy Transcending 2030"